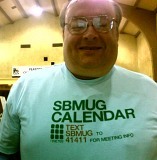 SBMUGers at the December meeting. 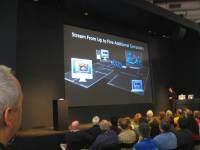 November 15th, 2007: Kevin Ponto gave us a tour of the new features in Leopard, the latest version of Mac OS X. Among the highlights: ¶ New time-saving ways of looking through your files: in Stacks in the Dock, with Cover Flow in the Finder — or flip through pages of a file in Quick Look before you open it! ¶ Easier file searches: The Sidebar displays shared files on networked Macs and PCs, and frequently used searches can be saved in the Sidebar. ¶ Easier backups and file recovery with Time Machine. ¶ Multiple desktop environments with Spaces. ¶ New features in Mail, iChat and Safari. 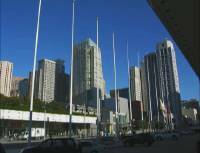 If you missed the show, have a look at Apple’s Mac OS X Leopard Features pages. files can be viewed in Cover Flow. 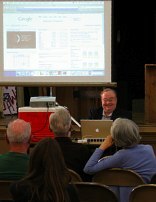 October 18th, 2007: Art Sylvester, president of the Santa Barbara Genealogical Society, presented Reunion, the excellent genealogy software for Macintosh. Version 9 has an impressive list of features and terrific ease of use. 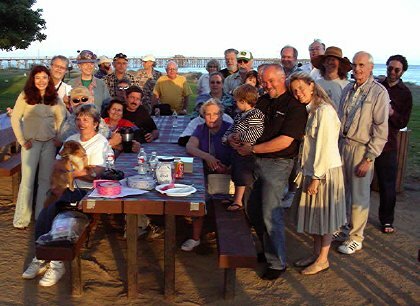 Macworld’s review of Reunion gave it a rating of 5 mice. 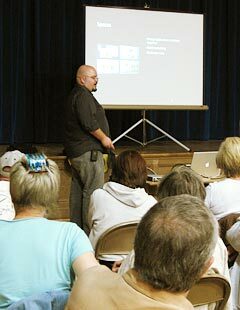 Art was our presenter at last year’s April meeting as well. 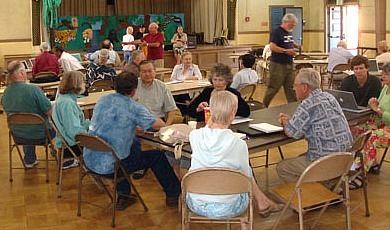 Some helpful genealogy links: www.familysearch.org • www.rootsweb.com • www.ancestry.com • Santa Barbara County Genealogical Society. A good-sized audience, as usual! 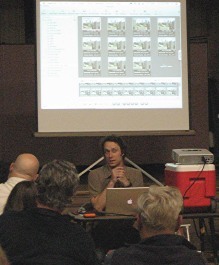 August 16, 2007: Harold Adams talked about iLife ’08, a suite of Apple software for doing personal projects (iMovie, iPhoto, iWeb, GarageBand, iDVD). 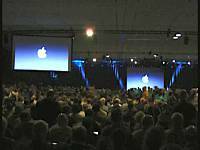 Then he showed a 20-minute guided tour movie, made by Apple. Mike B. watches the show. 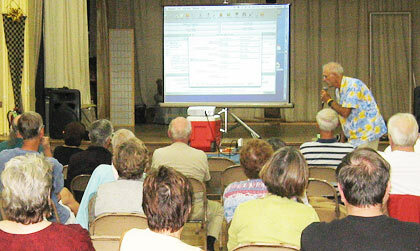 Harold gives his iLife presentation. Harold took many questions, and then showed two new iPhone TV commercials. Then he showed a video he made of his son, Ben, using Harold’s iPhone. Then Harold fielded more questions. 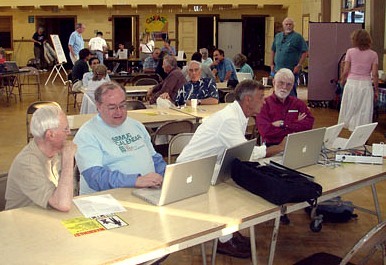 The raffle prize was the iLife ’08 software. The sky above Peabody School was smoky and dark from the Zaca fire north of Santa Barbara, but the atmosphere was warm and welcoming inside. 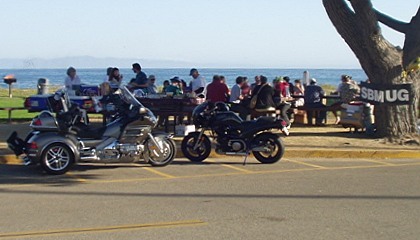 July 19, 2007: SBMUG’s first-ever pot-luck picnic at Goleta Beach! Thanks to everyone who cooked, carried, and showed up for this enjoyable summer evening! 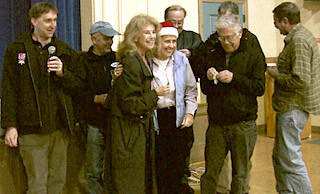 And the raffle prize was … an iPod Shuffle! Here’s the gang around the table. 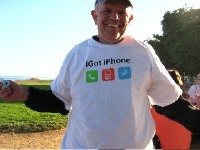 If anyone can text-message a tee shirt, Brian can. 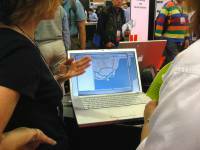 June 21, 2007: SBMUG held another of its popular help & demo nights. 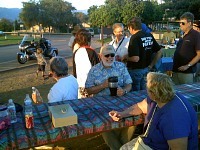 Plenty of people showed up to ask questions, exchange ideas and socialize. 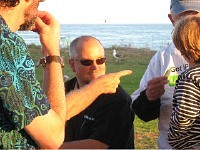 Ian, Mick & Mike answer questions, and Mike tells about the new iPhone. 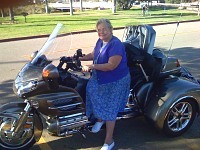 Kathy and visitors having a good time! Jeffery Morse with time-lapse photos. motion graphics and multitrack audio: Final Cut Pro 6, Motion 3, Soundtrack Pro 2, Color, Compressor 3, DVD Studio Pro 4. The Studio suite has many features useful in professional video production, and is designed for a smooth workflow among applications. The suite sells for $1299. Final Cut Studio 2 is designed for professionals, but Final Cut Express is a more affordable video editor with 85–90% of the features of Final Cut Pro. It makes an easy transition to FCP at a fraction of the cost: $299. The Apple TV is smaller than a MacBook. April 19, 2007: Kevin Ponto (from MacMechanic’s Help Desk) and Jon Dessert (from Samy’s Camera) showed us the new Apple TV and how it integrates into a home entertainment system. The Apple TV works with a variety of TVs from wide-screen and high-definition to non-HD and CRT models. It doesn’t record TV shows like Tivo, but there are rumors that it may in the future. It plays movies, TV shows, music and podcasts (including content pruchased from the iTunes Store), and displays photos from iPhoto. Album artwork can be displayed on the screen. And the Apple TV’s onscreen menus are easy to use with the Apple remote. 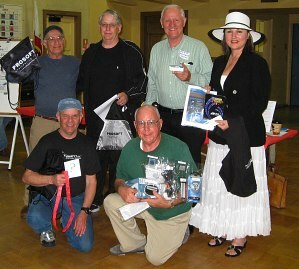 “It’s fabulous!” says Kathy G.
Some of our raffle winners! 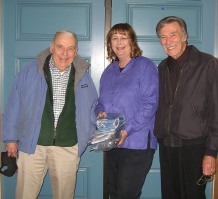 March 22, 2007: Gordon and Jennifer Bell, founders of Prosoft Engineering, Inc., showed us Data Rescue II, Picture Rescue, Drive Genius, Data Backup 3, and Jax for iPod, which allow you to back up, recover, maintain and manage your important data. 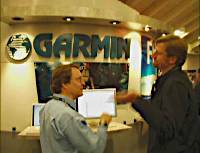 Prosoft’s products have won 4- and 5-star ratings in numerous reviews. OS X includes some drive utility software created by Prosoft. 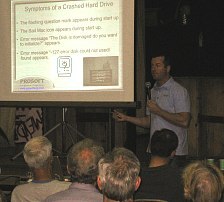 Prosoft’s Gordon Bell shows symptoms of a crashed hard drive. Data Rescue II recovers deleted files, and files on corrupted disks. Data Backup 3 supports a variety of backup types, including full bootable backups, incremental, version and selective backups; synchronization, compression, encryption, and scheduling and automating your backups. 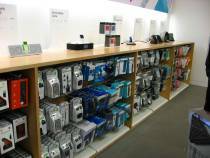 It makes backups to multiple CDs or DVDs, or any local or on-line volume that can be mounted on the desktop. Drive Genius defragments files and groups them together, can repartition “on the fly” after defragmenting (using a start-up CD), “repairs” problem disks, and more. Picture Rescue recovers images from corrupted camera memory cards, even when other utilities can’t; recovers deleted images that haven’t been overwritten; shows thumbnail previews so you can select files to recover or select all; reformats cards too. Jax for iPod finds information on performers, including recordings and whom they’ve performed with; searches for lyrics and album artwork, shows available albums from Amazon, iTunes and others; downloads and transcodes videos into iTunes Movies library; downloads RSS news to iPod (with Leopard it will speak the news too); gets movie times by zipcode, and directions from Mapquest or Google Maps. Thanks to Gordon and Jennifer for making Prosoft’s products available at the meeting at generously discounted prices. 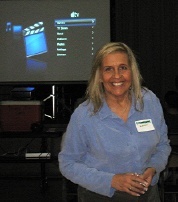 February 15, 2007: SBMUG held another popular Q&A-Demo-Help night. February was also the first month of SBMUG’s combined Beginners’ & Advanced Topics night, with both groups meeting at opposite ends of the auditorium. See the Special Interest Groups page for more information. 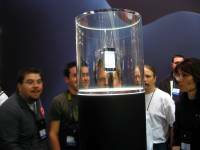 The iPhone was the big hit of the week. 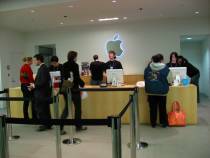 The iPhone was the big hit of the week. 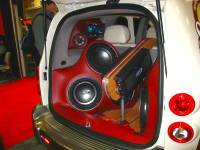 An iTunes-equipped PT Cruiser with a high-powered sound system. 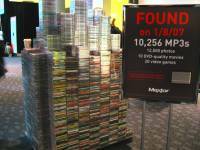 Maxtor’s paperback-sized hard drive holds this many MP3 photos, DVDs and video games. A MacBook Pro gets attention. without a visit to the Apple Store.